I’m always looking to learn from those colleagues in our industry who have been doing this longer than I have. 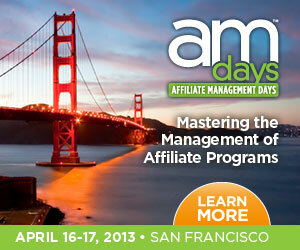 It’s for this reason that I’d LOVE to attend Affiliate Management Days 2013 in San Francisco. I wouldn’t have to pay for a hotel, or flight, or much of anything outside of my normal daily expenses since it’s just across the SF bay from me. There’s just one not-so-tiny problem. It’s a lot to ask – $1200 – not that it’s not worth it. This will be their second conference in San Francisco and I heard terrific things about last year’s show. Which was their first-ever, so that’s considerably impressive. I’d love to go hear insights from folks who do the same things I do. They’ve been where I’ve been. They know the daily stresses, challenges, and rewards that being an affiliate manager holds. So I’d be pretty crazy not to want to go! If you’re a fellow affiliate manager and haven’t already registered, but intend to, please do so through my affiliate link. The commission I earn will help me to pay for the pass. Share my post so others can potentially help. Thank you so much. Please – share my goal and help me contribute to the industry I so love by learning more and sharing my own knowledge at Affiliate Management Days SF 2013!